Rather than relying on antiquated optical design concepts such as parabolic reflectors, the 8700 Evolution has been designed to leverage the very latest in advanced optical design. These optics enable the 8700 Evolution to produce a beam pattern that not only surpasses DOT requirements, but also exceeds ECE standards (which are more stringent and used throughout Europe and other parts of the world). J.W. Speaker is currently the only major lighting manufacturer producing LED headlamps for the aftermarket which exceed both DOT and ECE requirements. The 8700 Evolution combines a full array of LEDs with high-tech optics to maximize the amount of useful light (effective Lumens) emitted. The optical engineers at J.W. Speaker have designed the beam pattern of the 8700 Evolution to minimize glare for oncoming traffic, while at the same time placing an even spread of light where drivers need it the most. In contrast, the beam patterns of inferior LED headlamps (those utilizing low-tech optics or parabolic reflectors) typically exhibit streaks, hotspots, and errant light that ultimately result in sub-optimal illumination and glare. “The 8700 Evolution’s new, more compact form factor is a product of customer feedback,” remarked Ryan Mayrand, Product Marketing for J.W. Speaker. “Our Jeep customers were finding that our original 7” round headlamp required some modifications to the inside of the bucket in order to get a good fit, so we’ve designed the housing on the 8700 Evolution to be a direct drop-in replacement – no modifications necessary.” The 8700 Evolution, like its predecessor, features a heavy- duty die-cast housing and now offers two different inner bezel styles to choose from: “bold” black and “muscle” chrome. And to back it all up, J.W. 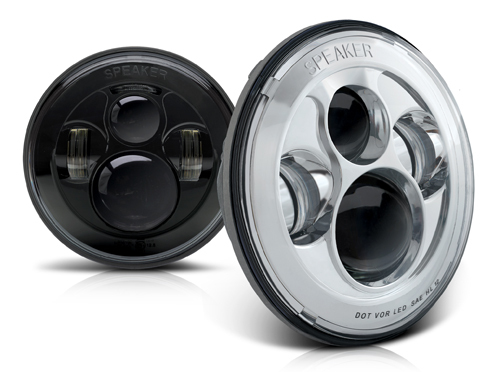 Speaker corporation even offers a best-in-class 4 year limited warranty on the product.